Vinogirl is back in Vinoland. I may have returned from my trip to Blighty, but Vinoland's grapevine leaves are currently in the process of, well, leaving. The biological aging of the vines, senescence, is very definitely taking place. Whilst the leaves were mostly green when I left, just over three weeks ago, they are now, for the most part, yellow. In fact, the leaf in the photograph is one of the very last leaves on the Orange muscat vines. Theory holds that it is decreasing day length that triggers the biological process of senescence. I really can't blame the leaves for departing, I do not like the nights closing in myself. But I'll survive: I'll patiently wait for the reappearance of Vinoland's grape leaves next March. My visit home has been a rather trying trip, but, as always, it is coming to a close. It is with mixed feelings that I leave England now. 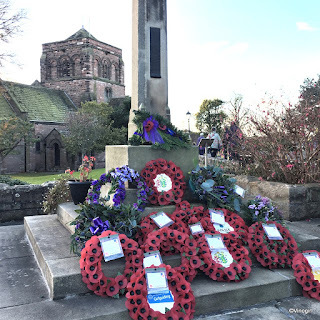 I did manage to slip in a little bit of English pageantry this afternoon, a Remembrance Sunday parade and the laying of wreathes of poppies at a local war memorial. Although a sombre event, it did put the faintest of smiles on my face. Lest we forget. There can be smoke without fire. 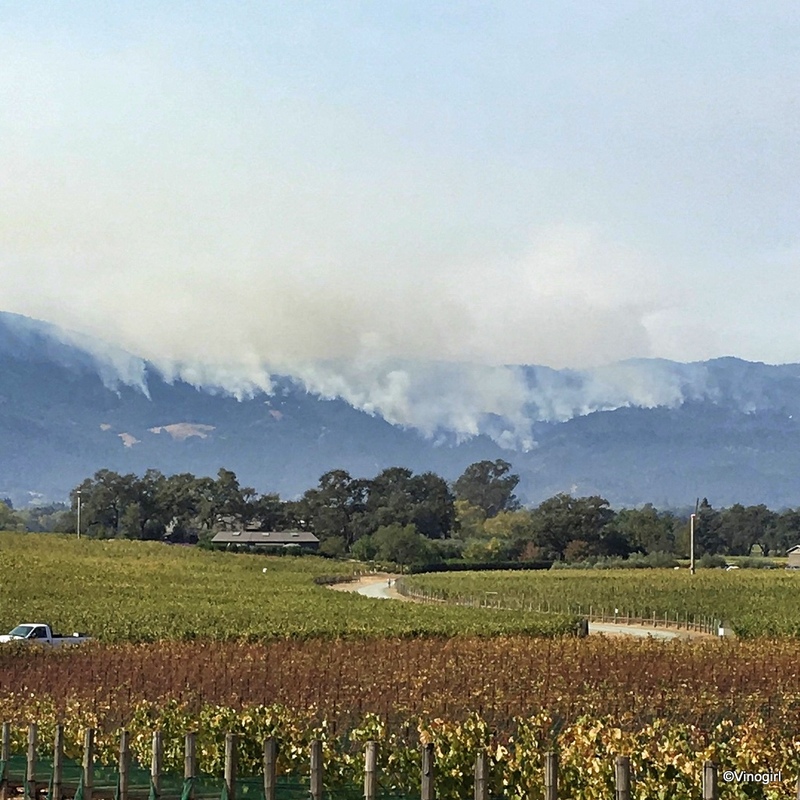 This photograph was taken on the 16th of October, the day I returned to work at TWWIAGE (after missing a week due to the wildfires that raged through my neighbourhood and the greater Napa Valley). 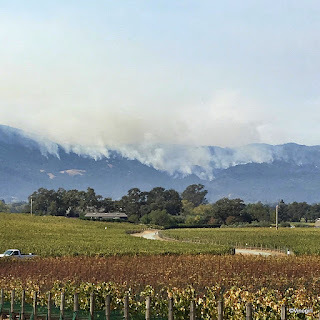 Whilst my home was by this time safe, the fires continued to burn around the valley (like here on the western Oakville hills, above the Robert Mondavi Winery), the air was still thick with smoke and people's nerves were worn a little thin. Thankfully, the calamitous fires are now history: albeit recent history. I've been busy since I arrived home, family stuff, but last night I was able to catch up on some wine industry news reading, e.g., Karen MacNeil's Winespeed newsletter. I generally like Winespeed, it contains short, snappy wine-factoids. (If I want to know more about a particular wine varietal, region or industry news I can look further into the topic myself.) In the October 27th issue, in a piece subtitled 'From the Oh No Files - Smoke Blunder', Ms. MacNeil takes umbrage at San Francisco restaurateur Michael Mina on the opening of his new restaurant, International Smoke. Editorialising that the opening of the grill is ill-timed, MacNeil deftly succeeds in making smoke a trigger word. Really? How long will this imposed moratorium on uttering the word smoke last? Are the words fire, flame, burnt or singed included? Is there a geographical boundary, i.e., if Mina was opening his restaurant in San Jose, some 80-plus miles farther to the south, would it be permissible for him to use smoke in the naming of his eatery? MacNeil's premise is specious and her 'Oh No Files' item is merely a silly, column inch filling, fluff piece. Yes, silly, except for the fact that it is rather irresponsible in its criticism of Chef Mina and the naming of his new enterprise. I think some of the wildfire smoke must have addled Ms. MacNeil's cranium.